hungrybetches / InstagramThe ultimate cheese pull we all wish we could achieve. Professional food Instagrammers know how to make every one of their photos look mouthwatering. They know what makes food look gross, they know how to boost their following, and they even know how to make a living off Instagramming food. But their job isn’t easy. We rounded up some meals that were photographed by professionals as well as the same ones taken by amateurs to show just how different dishes can look depending on who snapped them. Starbucks' new secret menu item, the pink drink, has the perfect rosé shade when paired with flowers, sunglasses, and nail polish. It looks a little less dreamy without the staged backdrop. These loaded tater tots look mouthwatering. They still look good here, but a little more greasy and not as crispy. Churros (drizzled in Nutella and dulce de leche) have never looked better. These churros have the same drizzle but look washed out, and not nearly as tasty. This sushi burrito looks perfectly packed and proportioned. This one looks a lot less stuffed. This whimsical-looking cotton candy milkshake almost pops out of the photo. This version pops considerably less. This breakfast burrito is bursting with cheese, meat, and avocado. Without the ingredients bursting out of it, the burrito looks less exciting. This cookies and cream croissant is framed just right with ideal lighting. The less-than-ideal lighting in this photo makes the croissant look less appetizing. This 3x3 animal-style cheeseburger from In-N-Out is drool-worthy. It's hard to believe this is the same burger. It's obvious that a pro stacked these cookies. The stacking in this photo just doesn't have the same effect. The angle and colours of this chicken and waffle photo makes it look beautiful. Comparatively, this chicken and waffles looks a little sad. You can almost taste the freshness of the jelly in these doughnuts. These jelly doughnuts don't have the same vibrant look. 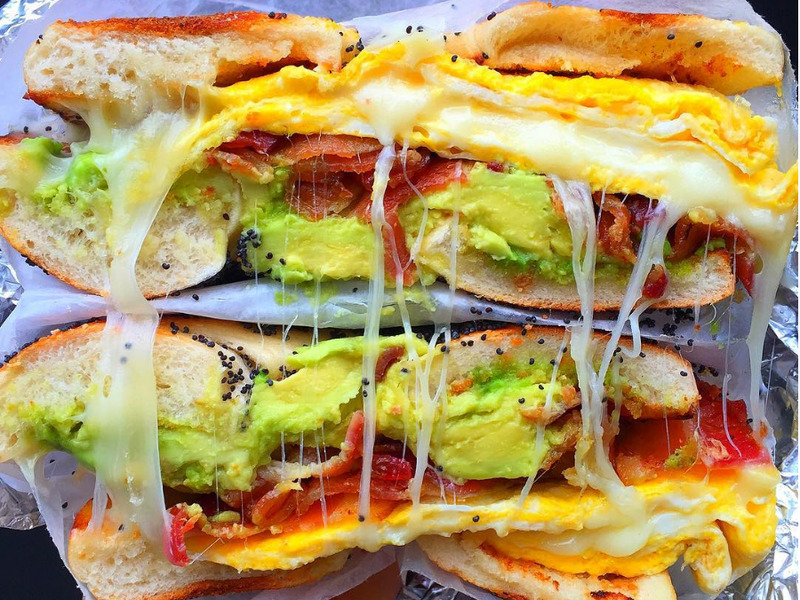 This bagel sandwich is saturated with colour and has the cheese pull we all dream of achieving. This same bagel sandwich, on the other hand, looks somewhat dull.